A lot of super hero movie updates this week and now another one just got out and I will be happy to share it to everyone. Warner Bros. and DC Entertainment just released exclusive photos from one of the miost anticipated DC Comics movie Green Lantern through Entertainment Weekly. And guess what, here is the first look on Ryan Reynolds wearing his costume. 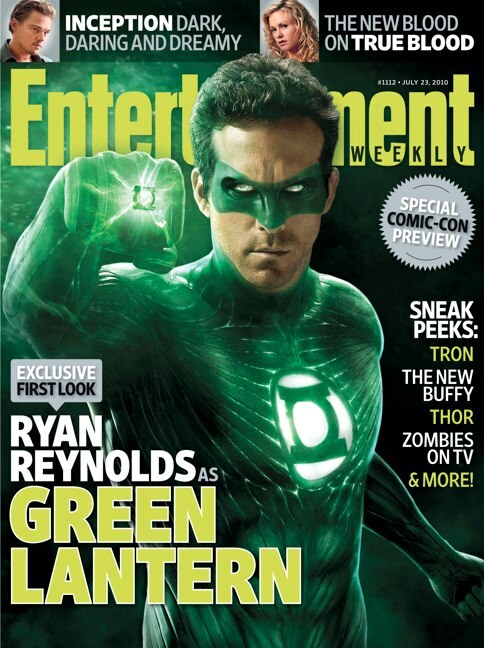 Well like what we all know, Reynolds don't really wear his costume since it is completely CGI. I kinda like the muscle-like design. It really gave the character a new look, far more different from the comic version. I really hope everything works out. Other than the costume several other photos are released on the pages of EW like the photo above of Reynolds as Hal Jordan and Blake Lively as Carol Ferris. Grab your copy of EW to see the other photos. I'm not a DC or even a Green Lantern fan, but I would be happy to see if this movie will come out good.